TS TRANSCO Released The JPO Results that both Qualified and also Unqualified List which is held on 14-10-2018, candidate those who are Attended the JPO exam can check their Results here. TS TRANSCO Released The list of the Candidates who qualified for the Candidates and also TS TRANSCO released the Unqualified list of the Candidates who attended the exam. So Candidates who attended the exam can check their Merit List here By Clicking on the Link here and download. 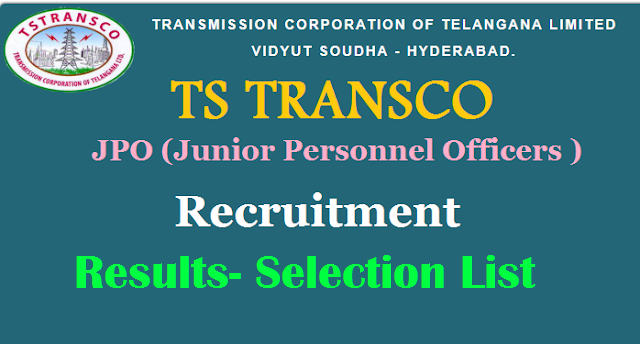 TS TRANSCO JPO released notification for 62 posts. as the candidates wrote the exam has checked the Key and also the Candidates are eagerly waiting for their results and they want to check the results that they are qualified or not. here we bring the good news for those candidates who all are attended for the JPO exam that they can check their results here.